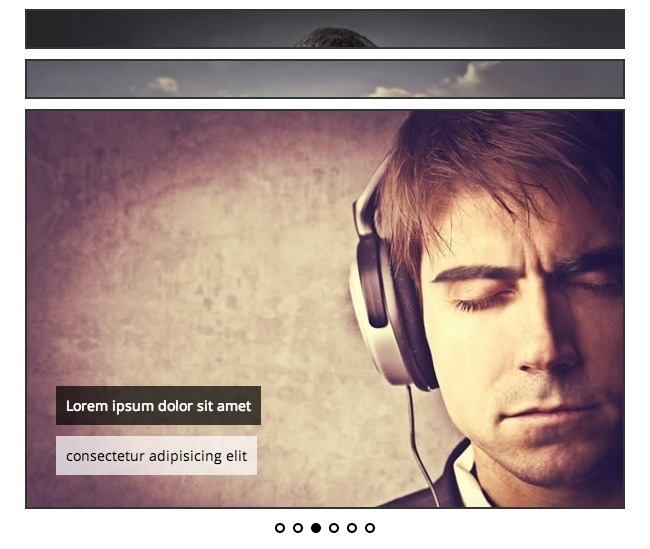 Accordion Slider is a fully responsive and touch-enabled WordPress plugin that combines the functionality of an accordion with that of a slider. 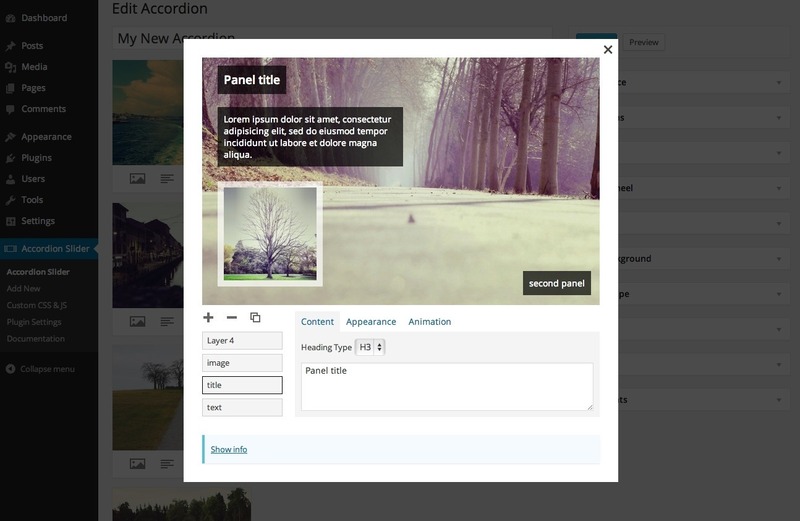 The Accordion Slider plugin brings the best of both worlds, offering a modern, intuitive and engaging user experience. Fully Responsive – automatic or custom responsiveness. Touch-enabled – touch-swipe and tap on mobile screens, mouse drag on desktops. Dynamic Content – load images and content from posts, galleries and Flickr. Automatic Updates -update the accordion directly from the Dashboard. 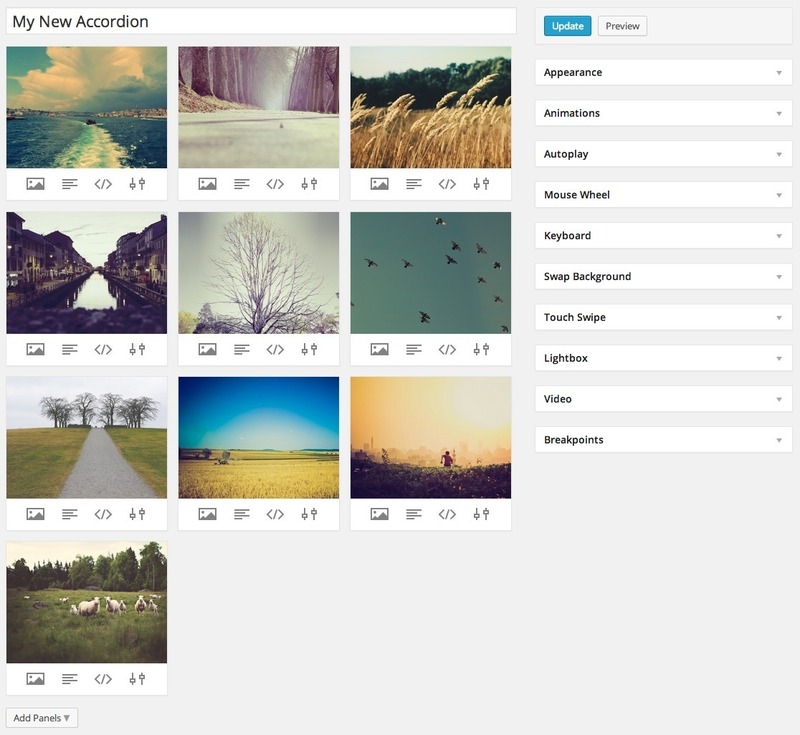 Pagination -add as many panels as you want without worrying about screen space. Animated layers – set layers to display when the panel is opened, or when it’s closed, or all the time. Caching – accordions are automatically cached for improving the load time. Inline help – instructions directly from the admin area. Load anywhere – in posts/pages, template PHP code, or widgets. Smooth animations – uses CSS3 transitions and RequestAnimationFrame. Retina-ready – specify a retina version for each image. 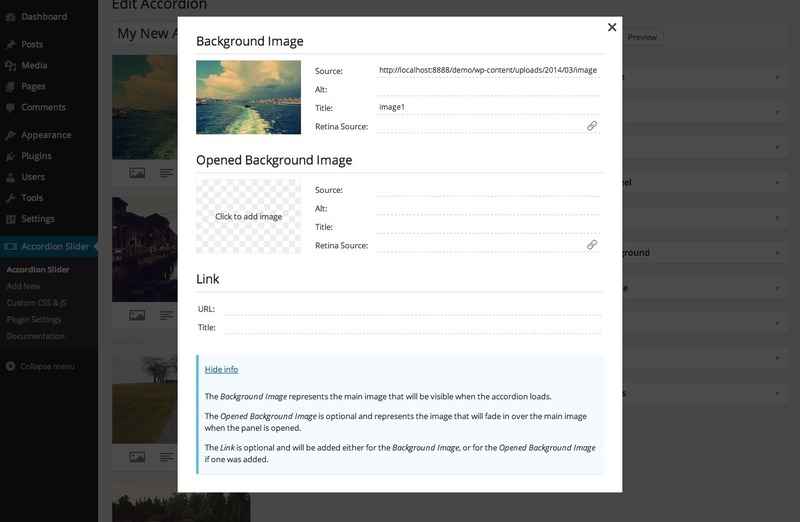 Swap image – change background image when panel is opened. Keyboard and mouse navigation – navigate using the keyboard keys or mouse wheel. Lazy Loading – load images only when they are viewed. 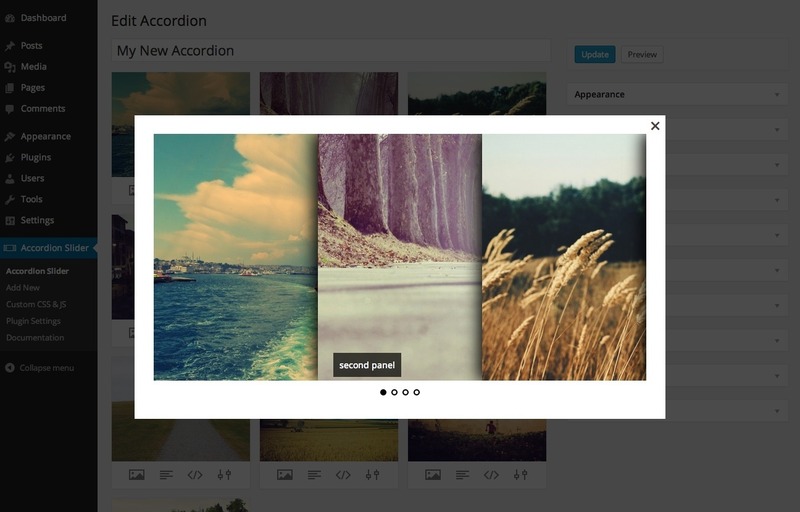 Lightbox – FancyBox is included and integrated with the Accordion Slider plugin. SEO-Friendly – all content is visible to search engines. 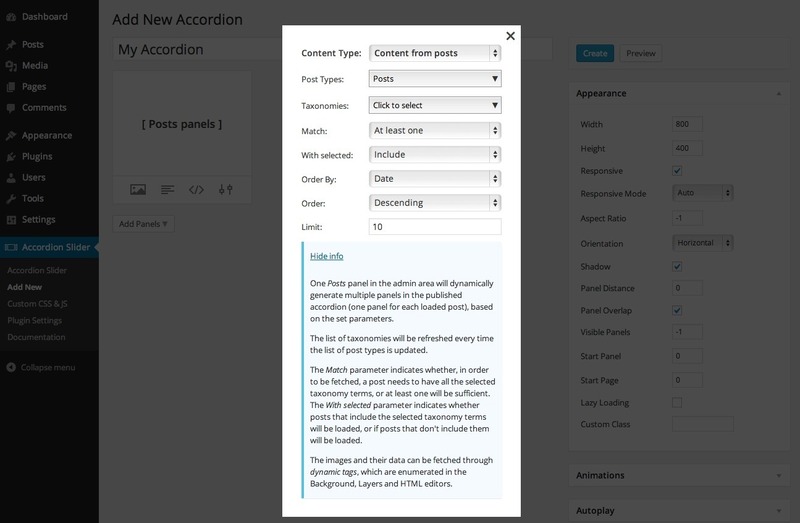 Deep linking – link directly to panels inside the accordion. Breakpoints – change the accordion slider settings at different screen sizes. Multisite – compatible with MultiSite environments. Action and filter hooks -highly extendable by developers. If you have any questions or need assistance with integrating the Accordion Slider plugin in your site, please feel free to ask; I will gladly help you. Also, if you like this script, please take a moment to rate it. Thank you!